Our domed polycarbonate roof lights are the most cost effective flat roof light option. 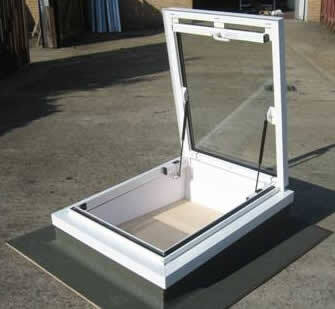 They can be single, double or triple glazed for high thermal efficiency. You can’t see through them so they provide a high privacy level. They don’t let in quite as much light as the clear glass roof light options. When you have a flat roof extension, the new internal room loses a lot of natural light so it’s vitally important to allow as much light in as possible through the flat roof structure itself. Roof lights are the perfect solution. The ideal way to finish off your new Rubberbond EPDM flat roof is by installing a domed polycarbonate roof light.